A delicious assortment of easy, tasty recipes perfect for weekend eats, get-togethers or game day! There's a Spinach Artichoke Dip, Oven Baked Curry Wings, Chipotle Hummus and more - something to please everyone and get the party started! This recipe for Arancini with Easy Marinara Sauce is sure to be a family favourite! Leftover risotto is cooled, rolled into balls and stuffed with cheese. Then, they are coated in breadcrumbs and gently fried until golden brown. Served with an easy marinara sauce, they make for one delicious, comforting bite! 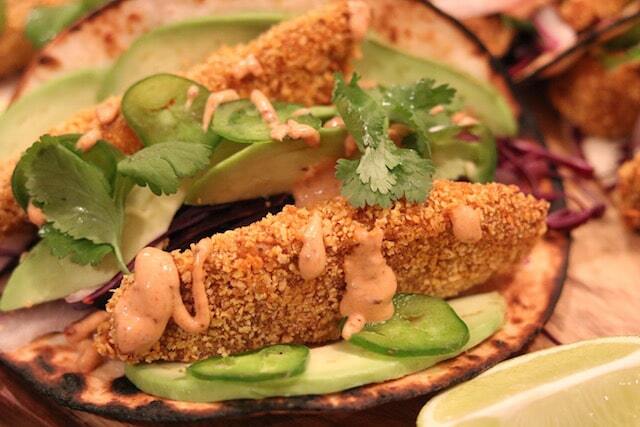 These Oven Baked Fish Tacos are bursting with flavour! The fish has a nice crispy coating, there’s lots of fresh toppings & it’s all topped off with a spicy and smoky chipotle sauce recipe. Plus, these baked fish tacos are on the table in under 25 minutes! So here we are! After all of the running around, baking, gift buying, and wrapping Christmas is on our doorstep! It’s pretty unreal how fast the time flies. Seemed like only yesterday that it was Christmas 2014. Now, here we are, a year later. This Easy Buffalo Chicken Dip with Dill is pretty much a classic and for good reason! There’s all of the delicious flavours of buffalo wings in a dip form. 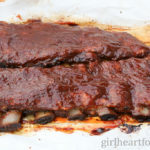 Yummy for weekend eats, parties or game day! Making your own homemade pizza dough from scratch is easy peasy! With just a few ingredients and a little time you could have a delicious base for pizza. This basic pizza dough recipe will make you forget about delivery! I love a traditional beef burger as much as the next person, but sometimes I want something a little different, a little lighter, and a bit more healthy. These Black Bean & Sweet Potato Burgers with Arugula-Lime Sauce are so tasty that you won’t even miss the meat! They are loaded with spices and are low in the fat department. If you omit the feta cheese, it would not only be vegetarian, but vegan. You can simply replace the feta with crumbled tofu or just omit all together and they would still be fantastic. This Seafood Dip is super super easy and tasty! I’ve made this dip so many times before and it is always a winner, plus it takes literally minutes to assemble. There’s a rich cream cheese base and then topped with seafood sauce, seafood and garnish. Perfect for parties! Crispy Oven Baked Wings with a curry spice blend – perfect for weekend eats, game day or parties. These will disappear fast! For this recipe post, I was actually going to call this ‘You Need This in Your Life Peach & Prosciutto Pizza,’ but that would have been a bit dramatic, don’t you think? But seriously, though, what a wicked combo! I mean peaches & prosciutto – how can you go wrong? In my mind, you can’t. Throw some brie and balsamic maple drizzle on top of that and it’s just magical. You, quite possibly, may not want to share! But, please do! Share the love, people! Stir together flour, yeast, salt, & sugar in a stand mixer - or by hand if you want to get a workout, especially if you're not sharing that pizza 🙂 Then, add 1 tbsp. olive oil and the water until a ball is formed (if too tacky, add a little more flour, about a tbsp. at a time; conversely, if too dry, add about a tbsp. of water at a time). Once everything comes together, place ball of dough into greased bowl (grease bowl with 1/2 tbsp. of olive oil), cover with wax paper and then a tea towel and place in a warm area for about two hours until it rises about double the size (I usually put inside the microwave - not turned on, of course). Preheat oven to 350 F and on a sheet pan with parchment paper, crisp prosciutto for 5 minutes; tear into bite-sized pieces & lay to one side. Increase oven temp to 500F & place your pizza stone in there and get that sucker hot! For the balsamic maple drizzle, mix vinegar with maple syrup in a sauce pan on low heat for 12-15 minutes until it coats the back of a spoon (make this while your pizza is in the oven). Remove dough from bowl and roll out on floured surface to fit pizza stone. Carefully take pizza stone from oven. Throw cornmeal on stone and place dough on stone. Working quickly, brush pizza dough with 2 tbsp olive oil, top with all of your ingredients (prosciutto, peaches, brie, onion, mushrooms & rosemary), except terragon and balsamic drizzle. Cook for about 12 minutes or so until crust is golden brown & toppings are heated through. Once out from oven, pour on balsamic drizzle, finish with tarragon and cracked black pepper. Slice into pieces and dig in! *Note: 1 tbsp of the olive oil is for making the dough, 1/2 tbsp is for greasing your bowl for dough rising and the remaining 2 tbsp is the base of the pizza dough when assembling. These Beer Battered Onion Rings are a favourite weekend or game day treat! They have a crispy, beer infused batter and are served with a smoky Chipotle Dipping Sauce. It’s hard to stop at one!